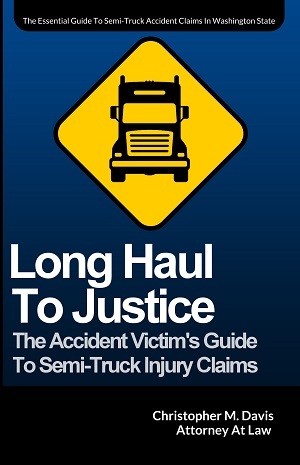 Our client suffered severe injuries as the result of a collision with a 24-foot semi-truck. These semi-truck accidents are all too common on American roadways, and as evidenced in this client's testimonial, the fallout is significant. By hiring Davis Law Group, P.S., to handle his case, our client was able to relax and let our team of experts fight against the trucking company's aggressive insurance adjusters. What I was told, because I can't remember from my accident because of the medicine they gave me at Harborview Medical, a 24-foot truck flipped over in front of me and I tried to avoid them and apparently I didn't avoid them very well. I hit him, hit the curb, the median, and flipped over three times and broke both my ankles, my left leg, my left arm and a few ribs. My wife decided to get an attorney immediately because of the severity of the accident and we didn't know how far we were going to go in debt because I was in the ICU for 20 days. My experience with the Davis Law Group has been very, very good. I like the reception, the people, Rory has been constantly able to answer any questions I have. It was really nice dealing with Rory the whole time. I'd tell them to come here [to the Davis Law Group], because I like the responses and all of the work that you guys did for me.